Harry Cooper was born on 30th January 1899 and baptised at St Paul’s Church, Foleshill on 20th December, later the same year. His parents John Cooper and Sarah Ann Finch had been married at the same church on 28 August 1898. John was a carpenter and Sarah the daughter of a railway guard. Harry Cooper – photo by permission of Rugby Library. By 1891 the family had moved to Rugby, living at 14 Riley’s Court, Dunchurch Road. John was a carpenter & joiner and by 1911 the family, Harry now had two brothers and two sisters, lived at 8 King Street. 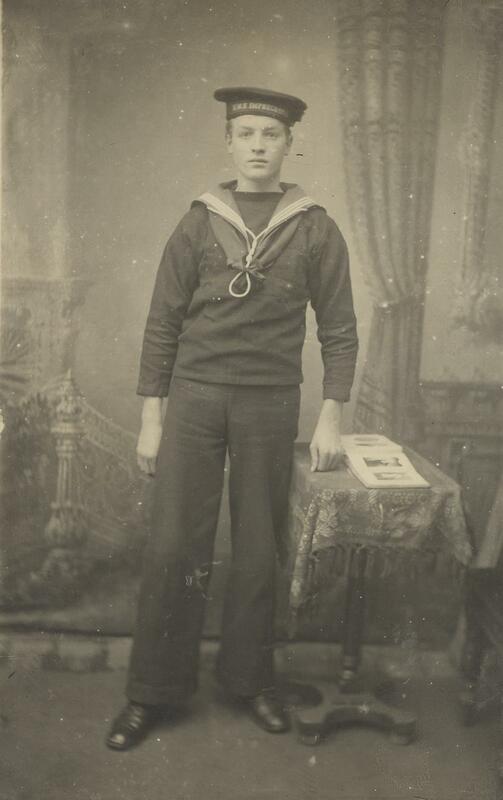 On 15th October 1915 Harry Cooper was sixteen years of age and a grocer’s boy when he joined the Royal Navy as a Boy 2nd class. He was 5ft 6¾in tall with auburn hair and blue eyes. After training at Portsmouth, he joined HMS Defence on 25th January 1916. 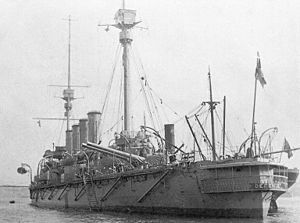 HMS Defence was a Minotaur-class armoured cruiser built in 1907, the last armoured cruiser built for the Royal navy. She spent the first part pf the war in the South Atlantic and in the Mediterranean, blockading German ships in the Dardenelles. During the Battle of Jutland on 31st May 1916, she was the flagship of Rear-Admiral Sir Robert Arbuthnot, leading the First Cruiser Squadron. Near the start of the battle soon after 18.00, after confusion and several near misses during the deployment of the British Fleet, Arbuthnot was attracted by the drifting hull of the crippled Wiesbaden. With Warrior, Defence closed in for the kill, only to blunder right into the gun sights of Hipper’s and Scheer’s oncoming capital ships. Defence was deluged by heavy-calibre gunfire from many German battleships, which detonated her magazines in a spectacular explosion viewed by most of the deploying Grand Fleet; she sank with all hands (903 officers and men). This entry was posted in Biography and tagged 1916, Battle of Jutland, Cooper, HMS Defence by Christine. Bookmark the permalink.